At the Original Sew & Quilt Expo last fall, I stopped at Jennifer Amor's booth and picked up this jacket-from-a-sweatshirt pattern and kit. I've been wanting to try and make a jacket from a sweatshirt. 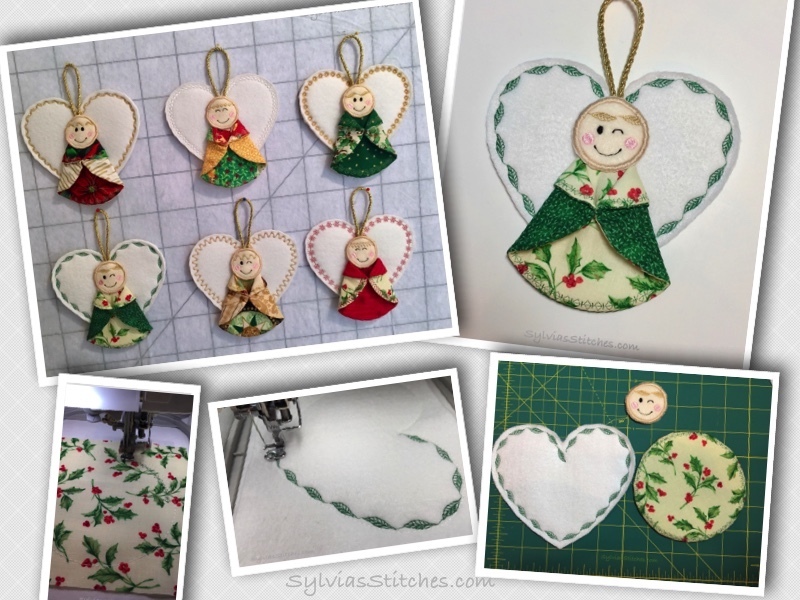 I thought this pattern was cute, but what I really liked was that she had a kit available All of the materials where already precut, and included the cute peppermint buttons. All I had to do was follow the instructions to cut the shirt, add the appliqué and bindings. 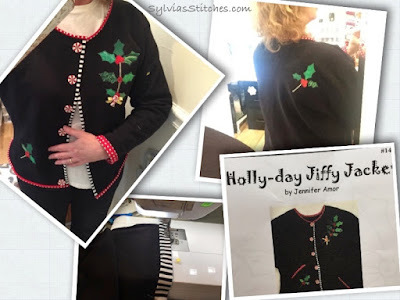 The construction involved sewing, appliqué and a bit of embroidery. I'm not totally happy with the final product - but it is my own fault. I wish I would have started with a sweatshirt that was two sizes larger than my normal, rather than just one. I also wish I would not have waited until the last minute to complete this project. I machine stitched the bindings to save time, but it would be a nicer finish if I hand-stitched the bindings. But at least I can say it is done. 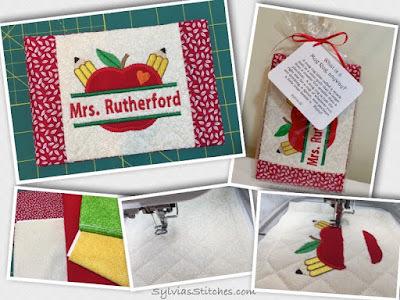 For a Christmas gift, my daughter gave her teacher a personalized mug rug. This one is from Oma's Place. I loved the quilting in the center panel and the split apple design. 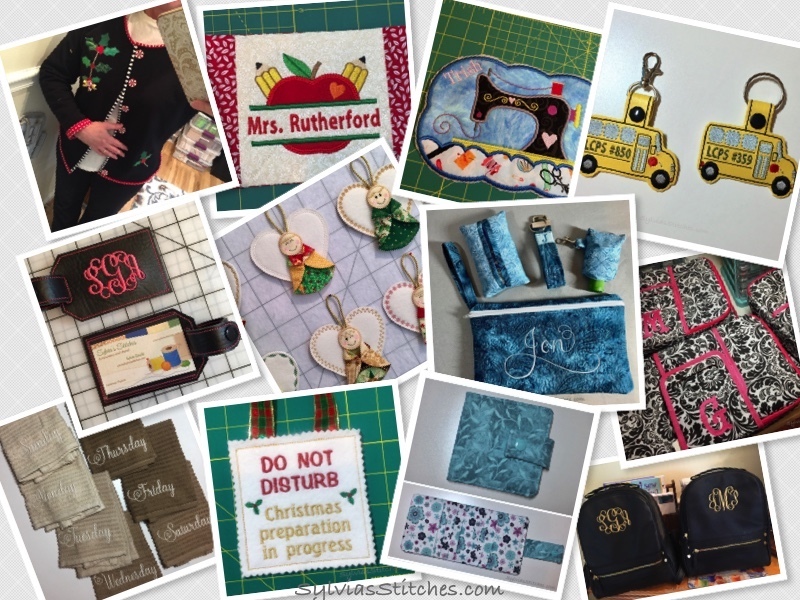 I put the mug rug in a clear cellophane goody bag, and tied it with a ribbon and Mug Rug tag. I found a version of this tag on Pinterest. 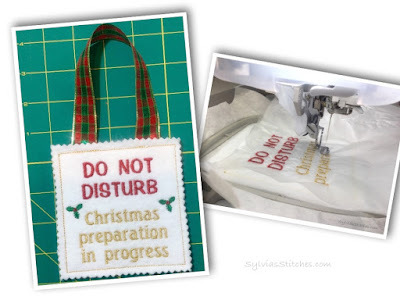 Just print the tag out on card-stock and trim. If you would like to download my copy of this Mug Rug tag, click here for a PDF version. 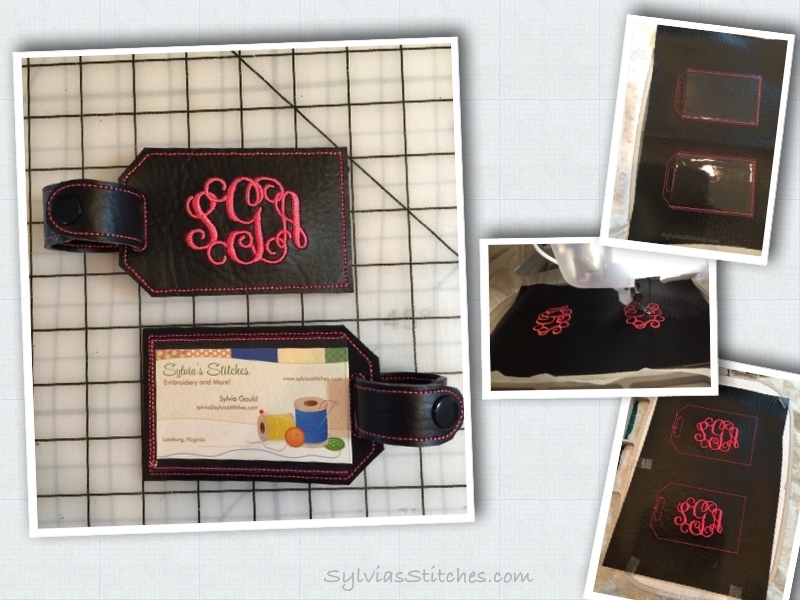 If you would like to customize your own Mug Rug tag, click here for a Word document version. 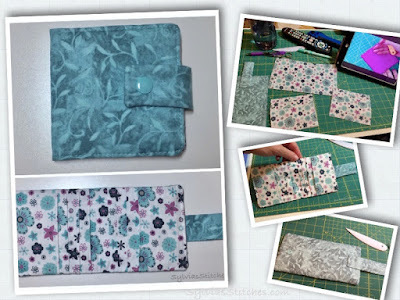 I have made one of these for myself, but I wanted to make another for a sewing friend. Didn't get a final pic of it, but did get one close to the end of it - just had to clear the edges. 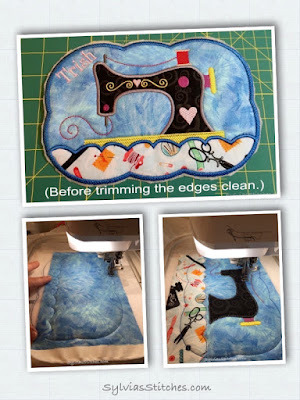 This mug rug design is from Applique Corner. 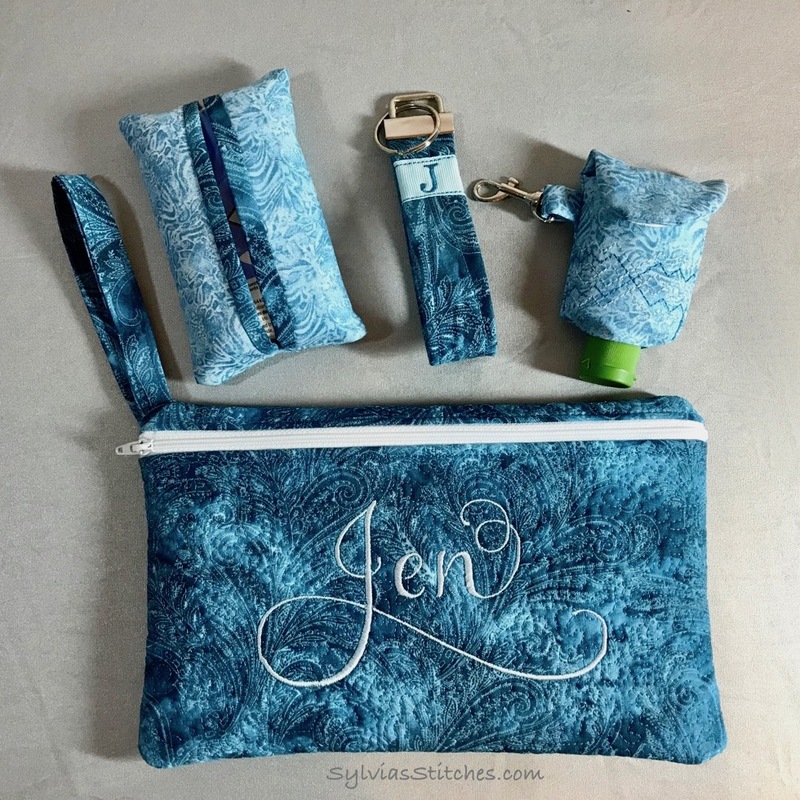 The sewing novelty fabric is from JoAnn, and the light blue background fabric is by Jinny Beyer. 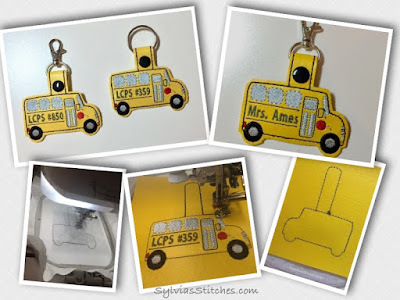 For Bus Driver Appreciation Week, I made a couple of school bus key fobs for my kids to give their bus drivers. Also made a listing for them on Etsy. I had not stitched on vinyl before, so this was a good way to try this out this medium. It stitched very smooth. I purchased the mvinarine vinyl from my local JoAnn store. The designs for the school bus is from The Bean Stitch. The bus stitches up quick after a template is stitched on the stabilizer. The back is finished to cover the stitching, and the hardware is attached with an easy kam snap. 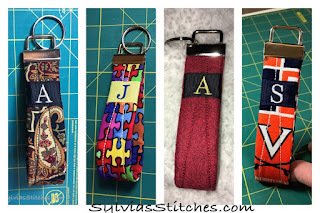 After the school bus key fob, I tried my hand at sewing some vinyl luggage tags. I wanted tags for my Destiny sewing machine luggage. This design is from Nana's Handmade Baby. 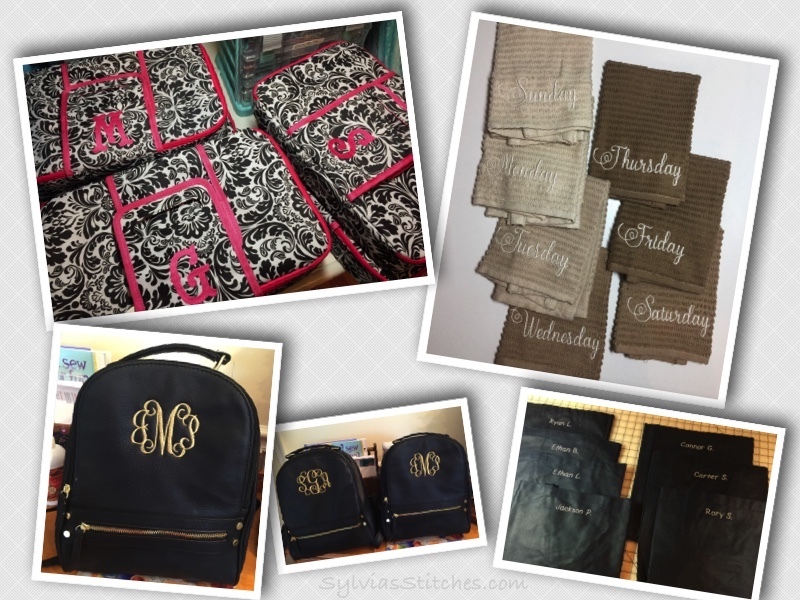 The monogram is the Intertwined font by The Itch 2 Stitch. The tags were done with two hoopings, plus another for the loop. The marine vinyl and clear vinyl was purchased at my local JoAnn store. I chose pink thread to match the pink embroidery on the Destiny travel bags. Really happy with how these came out. I stitched up a little gift ensemble for my sister's friend. - The zipper bag is from Anita Goodesign. The name is stitched using the Grace 1 embroidery font from Stitchtopia. - I've made hand sanitizers recently, and made another one with some embroidered stitching details this time. Design by Moose B Stitching. 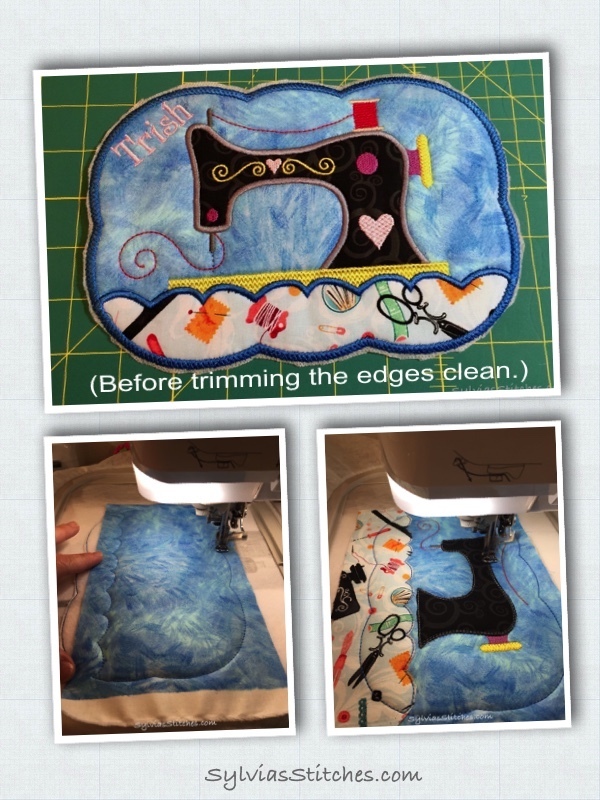 - The tissue cover was machine sewn. Instructions are on my blog here. 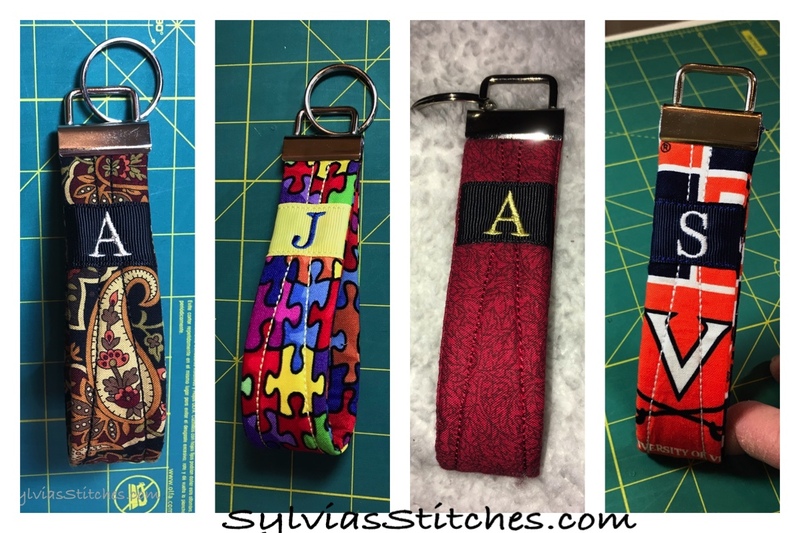 - I made this key fob and some others recently. They stitch out nicely too. The key sanitizer snap hook and key fob hardware were found on Etsy. This was just a fun little project to make. It is perfect because in our family, we do close ourselves off in a room when we are wrapping presents. This festive little sign adds a bit of fun to the process. I used different metallic threads with this to add some sparkle. The design is from Titania Creations. 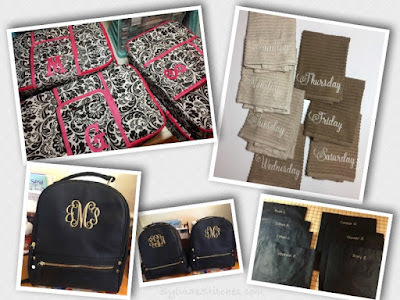 - The casserole carriers are from All About Blanks. The font on carrier is called Fancy Argyle by Stitchtopia. - The washcloths are from Target. The days of the week are stitched in Sarah 2 font by Stitchtopia. - My friend is a Cub Scout leader and ask for names to be added to reusable shopping bags she purchased for the boys in her den. I used a simple built-in font on my machine. And I LOVE IT! Thank you sew much!